The jury was very impressed by the public scale and importance of this project and its architecture. The ensemble represents a landmark and is nonetheless not a standalone building but a significant symbol in the urban landscape. Its architecture flows and is in constant flux. It opens out on to the downtown surroundings via a garden courtyard. 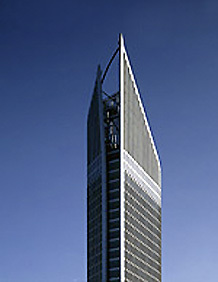 The offices are located on the façade, in full public view. The building is characterized by its vibrant, spacious architecture with a clearly defined façade that is in time and in touch with the edifice’s various functions. This is a »great« building in every sense of the word. Its ingenious design produces one of the city’s most elegant public buildings. 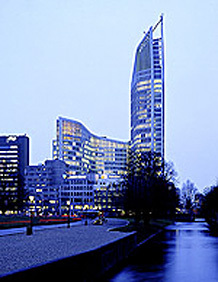 In comparison with conservative structures, the flowing shape of the building and its façade is lavish. It is evidently flexible as regards use. The perforated façade provides all the prerequisites for ongoing energetic business operations. A building that combines exclusivity with an efficient use of space at an appropriate price.